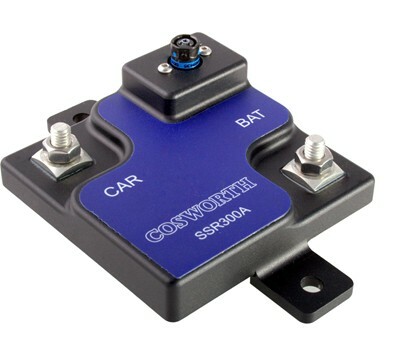 The Cosworth SSR300A is a ruggedized high power solid state relay designed to replace the master mechanical relay in performance electrical systems. Solid state MOSFET technology enables the SSR300A to operate under extreme shock and vibration conditions well in excess of the capabilities of a mechanical relay. This reduces the likelihood of electrical system failure due to high G impacts. The unit has an inbuilt diode which clamps the alternator voltage to the battery, avoiding the ‘load dump’ situation for other electrical components on the vehicle. The external controlling switch should also signal to the ECU to stop the engine.